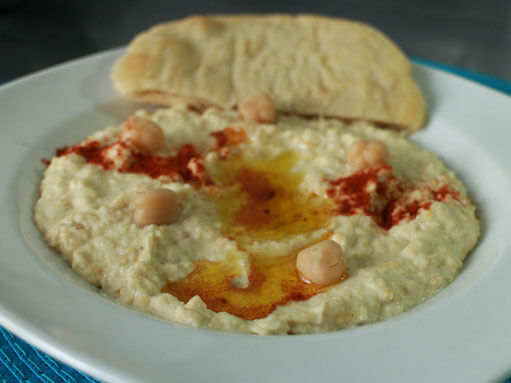 Hummus is becoming increasingly popular outside its native Mediterranean / Middle Eastern home. It's a delicious spread / dip of chick peas (garbanzos), tahini, lemon and garlic that goes well with almost any salad, fish or meat dish. If you are using pre-cooked chick peas, you can skip the soaking and cooking steps. If using dried chick peas, you'll need to soak them in water overnight, then boil them for an hour or two until tender (or 20-30 minutes in a pressure cooker). Whizz the tahini and lemon juice together in a food processor, then mince the garlic and add it along with most of the cooked chick peas (save a few whole ones for garnish). You'll also need to add 2-3 tablespoons of the liquid from cooking the chick peas, and a pinch of salt. Whizz everything together until you get the consistency you want, about 2-3 minutes. I like a fairly coarse texture, but if you like it really smooth that will take a bit longer. To serve, arrange in small bowls, drizzle some olive oil on top, sprinkle a bit of paprika and place whole garbanzos around. Eat with flat bread or as a side dish to another meal. The video above is from the Keef Cooks YouTube channel. Click here to see the video recipe of Hummus on YouTube. Water from cooking the chick peas, a sprinkle of paprika and a drizzle of olive oil to garnish. Prep time: 15 minutes. Soaking time: overnight.